Book size is 8-1/2 x 11 inches, softbound. 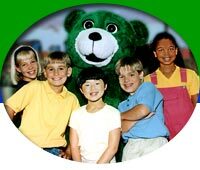 Why do children LOVE Kelly Bear? Kelly Bear shares his feelings and experiences FIRST and then asks children about their lives. This book is to be read by a parent, teacher, counselor, or other adult with a child or children. After reading each question, children respond as though they are conversing with Kelly Bear, so it is easier for them to speak openly. When the adult listens carefully and repeats what the child says, the child feels valued and accepted. The resulting adult-child communication and bonding fosters the child's self-confidence. This book furthers children's social, emotional and intellectual development. THEME: Everyone feels good and bad, now and then. Feelings include: happy, angry, lonely, excited, embarrassed, sad, proud, scared, jealous, and loved. Individually for $5.95 each from Childswork/Childsplay. 6-book set, one of each title, $31.97. The 6-book set is included in the Complete Kelly Bear Collection. Packs of 10 for $49.95.